Harriet’s gift and passion is in not just explaining how Mindfulness transforms lives, not just in showing how one can integrate this important tool into daily life, but most truly in working with companies who wish to take the “Mindfulness path” and incorporate this practice into the culture of an organization. A professional presenter, effective coach, and inspiring teacher, Harriet delivers to companies of all sizes – from small professional practices to global conglomerates – the tangible benefits of Mindfulness. 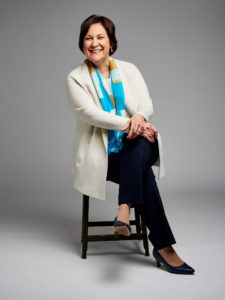 One corporate client she helped transform is a Fortune 50 household name; Harriet directly instructed more than 5,000 worldwide employees on Mindfulness via presentations and internal leadership summits. Harriet works with every client to determine how to take actionable steps to lead a healthier, more fulfilling life – both personally and professionally – through the practice of Mindfulness. With 35 years of experience in the healthcare industry, Harriet trained with and learned from the best: she participated in professional training with Dr. Jon Kabat-Zinn, Founder of the Mindfulness-Based Stress Reduction (MBSR) Program at the University of Massachusetts Medical School. She also completed advanced teacher training at the Myrna Brind Center for Mindfulness at Thomas Jefferson University Hospital in Philadelphia, PA.
A Registered Nurse, Harriet earned a Bachelor of Science in Nursing from Albright College and a Master of Science in Health Administration from Saint Joseph’s University.